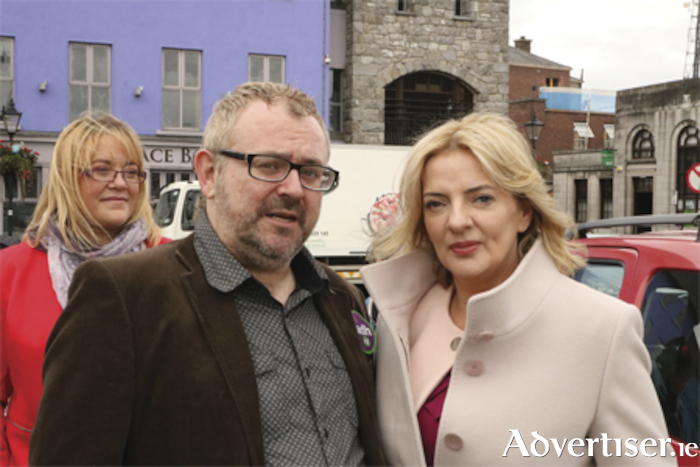 As part of her national campaign tour, MEP Liadh Ní Riada paid a visit to Athlone on Monday of this week. Owing to the nature of the national tour, her stopover in Athlone, albeit brief, was a positive one. The presidential candidate began her stopover at St. Peter and Paul’s church followed by a walk around the castle area and into our world famous, Sean’s Bar where she was met with all the features of yesteryear. Speaking later about the stop in to Ireland’s oldest bar, Liadh said, it was a “pity the schedule for the day was so packed”, as she “would have loved to stay longer by the welcoming fireside listening to the yarns being told”. From there, Ní Riada paid a visit to Athlone Community Radio where she was interviewed expertly by the station’s stalwart staff member, Irena Djak Cvetkovic, an in depth interview which is likely to be repeated in advance of the presidential election on October 26. The Sinn Féin presidential candidate expressed her views on the Midlands region and what she sees as being key political issues in Athlone and beyond. “There are a number of issues facing the area, firstly the lack of investment in the region is of concern but it is the lack of support for the defence forces is a huge bugbear for me. I know that many who are struggling have no choice but to take on additional jobs, as do husbands and wives. Even in my home county of Cork, this is blindingly obvious. “It is just as difficult there and it is nothing short of scandalous. I noted recently on a social media post that a soldier and his wife were taking on so much extra work to escape homelessness. We have such a proud record of our defence forces keeping the peace all across the world. Our brave men and women are held in such high regard globally yet when they arrive home, they are not getting adequate support. Ní Riada also spoke about the ongoing flooding concerns that often resonate across the town and stated that it was great to see progress being made on this, especially in this era of climatic change but “now isn’t the time to be standing by, action is needed hastily as we can see weather systems appear to be getting worse. Having the proper protections in place will be instrumental in the region’s resilience when faced with the woes of mother nature”. During her brief stop, the presidential hopeful was met by a group from St. Hilda’s and Liadh declined to move on availing of the opportunity to meet all present who were just as equally happy to meet the candidate. The election and referendum will take place in two weeks. Is she the candidate that will pose a credible challenge to the incumbent Michael D. Higgins? It will be an interesting fortnight, no doubt.